A quick call to Bob Cury at RJC Yachts confirms that he sold Broward's 30.4m megayacht Sea Bird yesterday to a direct client. 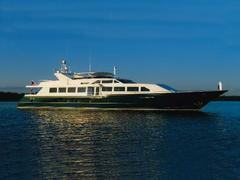 Launched in 1999, Sea Bird was throughly refurbished in 2007 and sleeps up to eight guests in four staterooms. Now renamed Just Right, the megayacht was asking $3.295 million.